Little bee restaurants of blue, yellow and purple flowers are popping up on people’s balconies and roofs in various countries in a grassroots effort to save the insects, as well as the basic fruit crops that depend on them. 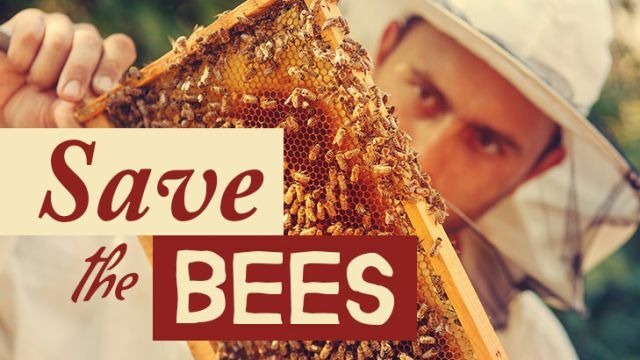 “Trees for Bees” was the theme of National Pollinator Week, that just finished up on June 26.. Around the United States, people held activities and actions to address the declining pollinator populations, including bees, butterflies, birds and beetles. Bee populations are falling at shocking rates. Beekeepers across the United States lost 44 percent of their honey bee colonies between April 2015 to April 2016, according to the preliminary results of a nationwide survey. In the last five years, 30 percent of the national bee population has disappeared, according to Global Research. Industrial agriculture, climate change, habitat loss and pesticides are to blame, as well as air pollution. In highly polluted cities such as Los Angeles the distance the scent of a flower travels has been reduced to just 1,000 feet, causing bees to become confused and exhausted as they try to find food. Official estimates put the value of pollination at $15 billion, the Middletown Transcript noted. And that’s being lost. Without bees, crops such as apples, avocados, grapes, cotton and many more would disappear altogether. Seventy-five percent of all flowering plant species need the help of pollinators for fertilization, and an estimated one-third of all foods and beverages consumed are delivered by pollinators. So for pollinator week, hundreds of groups, communities and schools around the country are organizing plant-a-thons, workshops and other activities. Farmers, beekeepers and activists also planned to rally outside the Environmental Protection Agency in Washington with 2.64 million dead bees. They want nationwide limits on pesticide use and to promote sustainable agriculture. Last year, the EPA proposed some restrictions on insecticides but they didn’t cover insecticide-coated seeds. Lobbying by companies such as Monsanto and Dow Chemical has stymied nationwide action. A solution to bee decline is providing them with food. Oslo, Norway has been one of the pioneers of the bee highway: a network of pollen pit stops on rooftop gardens and balconies. The goal is to have flowering habitats every 800 feet so bees can travel through Oslo. The highway is a collaborative community project involving schools, businesses, public organizations and residents in planting these pit-stops as well as installing bee-friendly shelters. Oslo hopes that by building these bee havens it will be able to direct bee traffic from east to west and thus offset the stresses of city life. The UK has been looking at doing something similar for a while now, creating a series of bee roads to provide corridors of wild flowers for bees, hoverflies, butterflies and moths. The plans aim to restore 97 percent of wild-flower meadows lost in recent decades and create beelines from east to west. Schools are getting involved by planting gardens, and students are learning to create “bee hotels” where the insects can nest and spend the winter. Ireland has a “pollinator plan” to encourage farmers, councils, schools and gardeners to create bee pit-stops. Transportation heads have agreed to reduce roadside mowing on main roads and to open south-facing railway embankments for nests. The plan includes producing a map pinpointing areas beneficial to bees which would be linked via wildflower corridors along roads. Finally, in the United States, President Obama has proposed a pollinator corridor focused around Interstate Highway 35, from Texas to Minnesota. The road roughly corresponds to the migration route of the Monarch butterfly from Mexico to Canada, and the idea is to have natural rest areas and landscapes in the general area surrounding the federal highway. National and local agencies will be able to coordinate efforts to rehabilitate prairie vegetation, educate and provide spring and summer breeding habitats along the path. A small water supply for bees and other pollinators will help too. A milk carton with a pinhole in the bottom is sufficient for some insects, and for butterflies a shallow plant saucer filled to overflowing with coarse pine bark or stones in it does the trick. It’s also important to limit pesticide use, especially during midday when bees and other pollinators are likely to be foraging. The worst that could happen if we all planted a few flowers is much more colorful city streets! Hey Buddy!, I found this information for you: "Bee Corridors Are Bringing Cities to Life". Here is the website link: https://www.thealternativedaily.com/bee-corridors-bringing-cities-life/. Thank you.